LAS VEGAS, Jan. 9, 2018 – With an eye toward the future, a zero-emission Kenworth T680 day cab equipped with a hydrogen fuel cell is on display at the 2018 Consumer Electronics Show (CES), which opened today in Las Vegas. The truck is part of the PACCAR Innovations booth exhibit (No. CP-32) – the first time PACCAR and Kenworth have exhibited at the show, which draws close to 200,000 visitors. 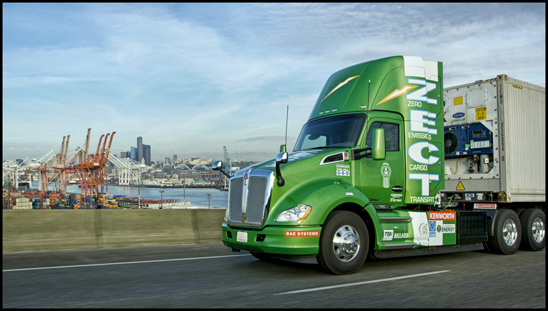 The vehicle is part of the Zero Emission Cargo Transport (ZECT) demonstration project managed through Southern California’s South Coast Air Quality Management District (SCAQMD). The Kenworth T680 day cab’s fuel cell combines compressed hydrogen gas and air to produce electricity with only water vapor emitted at the tailpipe. This electricity can power the dual-rotor electric motor to move the truck, or it can recharge the lithium-ion batteries for use later. The hybrid drive system manages the power from the fuel cell to and from the batteries, as well as the traction motors and other components, such as the electrified power steering and brake air compressor. To see the Kenworth T680 ZECT truck in action during testing in Seattle, click on the following link: https://youtu.be/ShgYjFb4Pp8. The market is being driven by progressive states, such as California, where clean air is the mandate. To develop the hydrogen-based T680, Kenworth is supported by $2.8 million in funding under a larger grant from the U.S. Department of Energy (DOE) Office of Energy Efficiency and Renewable Energy (EERE), with Southern California’s South Coast Air Quality Management District (SCAQMD) being the prime applicant. Project oversight is provided by the Center for Transportation and the Environment (CTE). Kenworth is also working on a second project under the larger program for DOE and SCAQMD to develop a near-zero emission-capable T680 day cab using a near-zero natural gas engine and generator to extend the battery range.